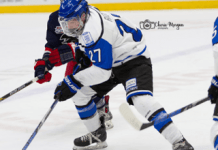 Calgary, AB – Carter Chorney’s overtime winning goal propelled Team Alberta to its fifth Western Canada U16 Challenge Cup championship on Sunday afternoon at the Markin MacPhail Centre in Calgary. 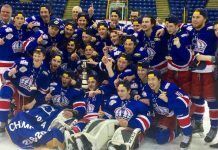 All it took was 31 extra seconds for Chorney, a second round pick of the Spokane Chiefs, to bring the game to a 3-2 conclusion as Alberta edged British Columbia and claimed its third consecutive title, dating back to 2013. The event was not hosted in 2014 due to the Canada Winter Games. “I just swung to the right wall there and got a pass from Matthew Robertson,” Chorney said, recounting his tournament-winning tally. “I was just thinking shoot, shoot and get someone going to the net. I was lucky enough, got the shot through, drove the net and put it in… It was an unbelievable moment. While Chorney celebrated on the ice, co-captain Kirby Dach and the rest of the Alberta bench erupted, overflowing from the boards to join their overtime hero. “He shot it then crashed the net and there was a rebound,” Dach said, replaying what he saw from the bench. “He poked it in and it slowly crossed the line. It was one of those goals. Everyone on the bench just erupted. Guys were jumping off, throwing their helmets and gloves. It’s just a great feeling. “I can’t put it into words, it’s indescribable. We’re very honoured to be wearing this jersey for our home province and especially to take home gold. It’s just a great feeling all around. Chorney’s heroics came after Team BC’s Alex Swetlikoff, a third round pick of the Seattle Thunderbirds, tied the game 2-2 with only 5:11 remaining in regulation. From there, Alberta goaltender Taylor Gauthier preserved the 2-2 tie, making a ridiculous glove save in the dying moments of regulation to push the game to overtime. 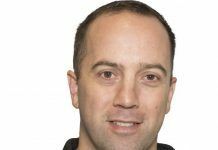 “On their tying goal, I misread the play a little, didn’t look out front and they beat me on that,” said Gauthier, a first round pick of the Prince George Cougars. “In the dying seconds, the same play kind of developed. It started down low and they put it up to the face-off circle. I just read it, had a little anticipation, put my glove out and it went in my glove. Sunday’s gold medal contest between Alberta and BC was a fitting end to a tournament that was tightly contested from start to finish, as both teams enjoyed glorious opportunities and displayed masterful skill throughout. Alberta got off to a good start, but BC held its ground and battled every step of the way. Goaltender Roman Basran was tested early, called upon to make a big glove save only 11 seconds into regulation after Alberta forced a turnover deep in BC territory. Gauthier was tested in his own right midway through the first period with BC on the power play. Some swift puck movement created an opportunity for Massimo Rizzo in tight and the BC captain redirected a quick shot towards the net, but Gauthier was there with an answer. When the night was finally done, the product of Calgary had made 32 saves. Ethan Browne, a first round pick of the Everett Silvertips, opened the scoring in the dying moments of the first period for Team Alberta. Taking a pass from Kootenay ICE prospect Peyton Krebs, Chorney cruised in over the BC blueline before making a strong play towards the high slot. The puck bounced to Browne who wasted no time, sweeping a one-timer through Basran to give Alberta a 1-0 lead with 37.6 seconds remaining in the first period. Alberta doubled its advantage in the early stages of the second period. Dylan Holloway carried in over the blueline, dropping a pass back to defenceman Rhett Rhinehart. The 6-foot-2 blueliner sent a long shot towards the BC cage as Holloway drove the net, catching a slight redirect to send the puck to the back of the cage for a 2-0 Alberta lead with 16:29 to go in the second period. Ethan Leyh got BC on the board with a power-play goal in the second period. After Rizzo set the table, Jacson Alexander’s point shot found a way through a maze before Leyh pounced on the rebound, making it a 2-1 game with 12:33 remaining in the second period. Basran continued to take care of his blue paint in the second period, making a diving glove save, robbing Alberta of a glorious backdoor opportunity on a power play. At the other end of the rink, Gauthier went save-for-save with Basran. After a turnover in the high slot, Gauthier was forced to make a big glove save off Kolton Cousins, preserving a one-goal Alberta lead with roughly five minutes remaining in the second period. 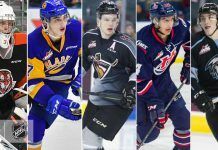 With gold hanging from around each of their necks, players from Team Alberta head their separate ways, back to their club teams and back to preparing in hopes of making the jump to the Western Hockey League come next season. But what remains is a bond established over a hard-fought tournament and an experience each of these players will remember for the rest of their lives.